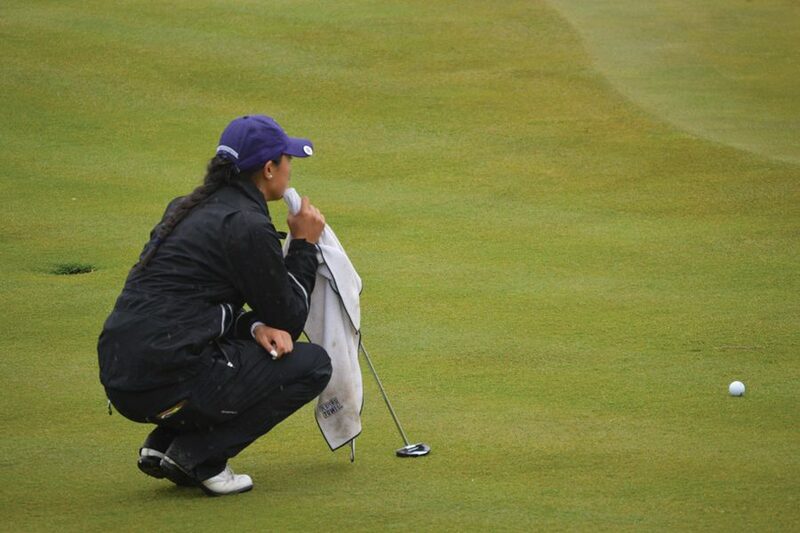 Janet Mao analyzes a putt. Mao led a great Sunday outing for the Cats, salvaging an otherwise lackluster Big Ten Tournament showing. Northwestern rolled into Maineville, Ohio, having finished first or second in three consecutive Big Ten Championships, but two brutal early rounds left the Wildcats with their worst finish at the event since 2012. After the team shot 5-over par on the first round, NU sat in fifth place, 10 strokes off the lead. That gap widened to 17 strokes Saturday, as the Cats combined to shoot 4-over while other teams piled up birdies. Junior Janet Mao spearheaded a furious Sunday comeback, in which NU finished with the best round of the day at 8-under. At one point the Cats sat at 12-under, just three strokes off the lead, before falling back. Mao was the top individual finisher for NU, shooting up the leaderboard into fourth place on the back of a 6-under 66 in the final round. After shooting 2-over through the first two rounds, Mao finished at 4-under, five strokes off the lead. Mao’s 66 was tied for the lowest round on the weekend from any golfer in the 84-woman field. She birdied three of her first four holes and finished the round without a single bogey. Seniors Hannah Kim and Sarah Cho, each playing in their final Big Ten Tournament, both struggled in the opening two rounds as well, combining to shoot 11-over before the final round. While Cho pulled out an even-par final round, Kim powered her way to a 2-under performance and finished tied for 22nd. The six Cats golfers combined for only three individual under-par rounds on the weekend: Mao and Kim’s final rounds and a first-round 71 by junior Stephanie Lau. Lau, sophomore Brooke Riley and junior Monica Matsubara all finished tied for 25th at 5-over. NU tied for the tournament lead in birdies with 49, but a bevy of bogeys and double bogeys held the Cats back. NU finished well off the pace with only the sixth-most pars in the tournament. The Cats will likely receive an at-large bid to an NCAA Regional, where Fletcher hopes the team can build off its impressive final round.